The concave technique is one of balance, of Yin and Yang. A double-sided door, the exterior is sensual and inviting – while the interior’s spheres provide a blanket of privacy. Though opposites they share a common trait – they are both dramatic backdrops that make a unique statement. 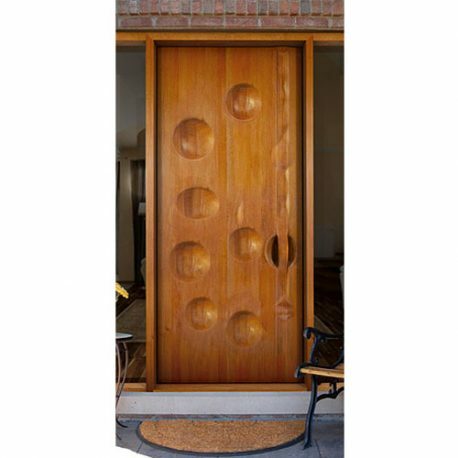 Concave doors can be made with various sized concaves, and with various types of designs. Double-sided: $150/ per sq. ft. 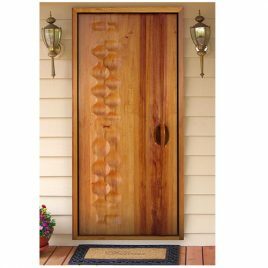 This set of patio doors features a band of beautifully rippled wood which looks as if a Cubist sculpted his rendition of a relief of peaks and valleys. The rich wood lends solidity while the big clear panes and light stain finish promises to draw in freshness, light and air. This figure trapped in twisted wooden form is like a vision of Pompeii. The flat plane of the door expresses its smooth and solid beauty, thereby lending intense focus to the framed artwork. There is nothing like the shape of a woman, and many an artist has been enraptured by it. 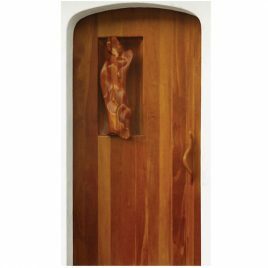 These sculpted doors serve as beacons of beauty, as splendid from afar as they are up close, beckoning to seekers of loveliness, and promising of the joy and ease found within. Available in Front, Back, or Whole (must be double-sided) styles. The rippled texture of the wave door reflects light and calls to mind visions of oceans sparkling in the sun. The weary traveler seeking shelter and comfort cannot help but be refreshed.